Unlike the other historical topics I've posted about so far, hops in spontaneous fermentation is something that I sort of fell into. I noticed a common theme while researching other aspects of historical lambic brewing - the mention of fresh hops. If someone would have asked me what I thought about hops in lambic two years ago, I probably would have only had a couple sentences on it. Something to the effect of: use aged hops (obviously) and at some specific rate which I would have calculated based on interviews (probably from Cantillon since Jean is the brewer who speaks most freely about these sorts of things). And this is exactly why the re-occurring mention of fresh hops struck me. So then I began to look into it specifically. And this all led to this post here. I'll focus mainly on traditional lambic - what is done now (hop types and hop amounts) as well as the same for what was done historically (mid 1800s to now). I'll close with a bit of hop use in non-lambic spontaneous fermentation, though there is way more out there in this regard than I could cover here. Hops aging in Cantillon's attic. As I mentioned above, I think that almost without fail, if you ask about hops in lambic people will tell you that you need to use aged hops. This is certainly the modern standard, and until recently I believed it had been the historic standard as well. Of course there are modern beers of more classic spontaneous fermentation with non-aged hops such as Cantillon's Cuvee St. Gilloise (fresh hops in dry hopping). And rumor has it that Oud Beersel is using some younger hops, but I haven't received a clear answer on this (it seems at least that it was an attribute of their lambic in fairly recent history). And I've noted before that Cantillon is working toward some trials with younger hops in their normal lambic (I've been updated recently that this batch is still in planning and the hops are being saved for a trial at an early 20th century lambic). But these are exceptions to the rule of modern lambic being a beer with aged hops. Modern aged hops for lambic – As mentioned a couple times so far, modern lambics almost always use aged hops. These are noble or noble-type hops on the order of 3-5 years old. The notes I have from Cantillon during the 2013-2014 brew season list Tettnang 2010 and Saaz 2009 for one brew and Target and Hallertau (ages not noted) for another. Cantillon stores these hops (whole hops) in bales in their attic, which can get reasonably warm in the summer. Especially when they are brewing. So noble or noble-type hops at roughly 3-4 years old. No surprises there if you've read about hopping in homebrewing books such as Wild Brews. In interviews Jean has listed hopping rates of 250-300 g/Hl of wort (Cantillon on the Sour Hour, 49 min in) and ~450 g/Hl finished beer (Cantillon on Basic Brewing Radio, ~43 min in). Jean has also told me in discussions that they use this latter number for their hopping rates so I suspect the previous refers to a different volume point (maybe start of boil or something like that). Other lambics can be more hoppy. I have had blenders tell me that they feel that Girardin is too hoppy for their tastes to use exclusively for geuze but that they like how it works as a blending component. Drinking Girardin lambic you can taste the elevated bitterness. And I know there can be some variability batch to batch - I’ve had some Girardin lambic that was really hoppy (even though it was a few years old) and tasted surprisingly like Iris. 3F isn’t necessarily more hoppy, but back in 2011 Armand mentioned to me that he felt the hops he uses were important for the character of his lambic. He specifically noted the green apple character as something he felt the hops contributed to. The specific hop he mentioned slips my mind now and I’ll have to check back in old notebooks to see if it is there. I am hopeful it will be because (as evidenced by the notes post) I tend to err on the side of writing too many notes. Historic hopping of traditional lambic is something I have discussed in pieces in other posts (Biere de Mars parts one and two as well as on the blog's facebook page in posts such as this one). It seems pretty standard that younger hops was used. This shows up in Lacambre (so 1851) as well as Le Petit Journal du Brasseur in the 1900s. Lacambre recommends Belgian hops from Aalst or Poperinge at a rate of 780-860 g/Hl (1.04-1.15 oz/gal) for lambic and 400-500 g/Hl (0.53-0.67 oz/gal) for bière de Mars. For those unfamiliar with Belgian hops, these are the two main Belgian hop growing regions (in the modern day Poperinge is probably the one bigger region). Specific recipes are given later in this article with amounts in this general range: 58 pounds of young Aalst hops for 34.5 Hl of lambic (762 g/Hl or 1.0 oz/gal). It is interesting to note that young hops are mentioned specifically and that there is not mention of old hops in the recipe or the text describing lambic. For bière de Mars, a bit less than half of this is recommended: 25 lbs for 34.5 Hl (328 g/Hl or 0.44 oz/gal) with no specific mention of aged or fresh hops. Hopping in lambic shows up repeatedly in Le Petit Journal du Brasseur. A 1909 response (citing a presentation from 1896) advises that the ratio of young to old hops was preferably around 2/3 young and 1/3 aged, but in a bad year for hops it could be 50-50. So this means it was preferable to use more younger hops. I'm not sure if it was thought that some aged hops were necessary or if was simply based on practicality that some aged hops were always suggested. But whatever the case young hops were a prominent component of lambic. This is certainly not commonplace now. This same response of PJB advises 3 pounds per 250 L (540 g/Hl or 0.72 oz/gal) for lambic, with the aged hops (Belgian) being added when wort hits the kettle. So sort of like first wort hopping. The fresh hops (sometimes from Bavaria) are sometimes added 15 minutes after boiling starts, which still means they are boiled for some time. For bière de Mars (more about about lambic bière de Mars here: part 1 and part 2) half of this hopping rate is advised (1.5 lb per 250 L; 270 g/Hl or 0.36 oz/gal) with 4/5 aged and 1/5 fresh. These hops are added shortly before the boil starts. Finally the response states that most brewers prefer the hops of Aalst over Poperinge, but that this is not universally felt and some prefer Poperinge. Another article from 1928 gives a bit more info on hop variety and usage. They suggest 1.5 kg per 250 l (600g/Hl or 0.8 oz/gal), which they note is also roughly 2.5 kg per 100 kg grain. 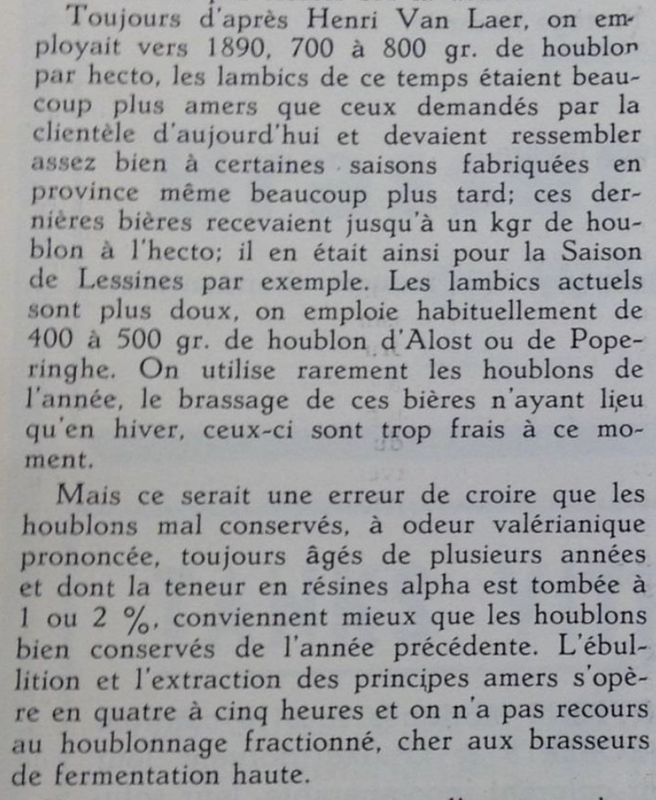 This article shows that lambic is starting to change in terms of hop age by recommending that it is best to use the inverse of recommendations from 1896 - 2/3 aged hops and 1/3 fresh. They do note that some brewers go too far with the old hops, suggesting that some fresh hops are still deemed necessary. They note that Belgian hops (from Aalst or Poperinge) are best and they specifically recommend the variety Coigneau. This is the same variety recently used fresh by Cantillon in the trials noted above. The recommended hops are from Aalst or Poperinge and they specifically mention that other hops (from Bavaria, Alsace, America) are no good as they give an unpleasant bitterness. This matches other recommendations I’ve seen from PJB in the early 1900s. 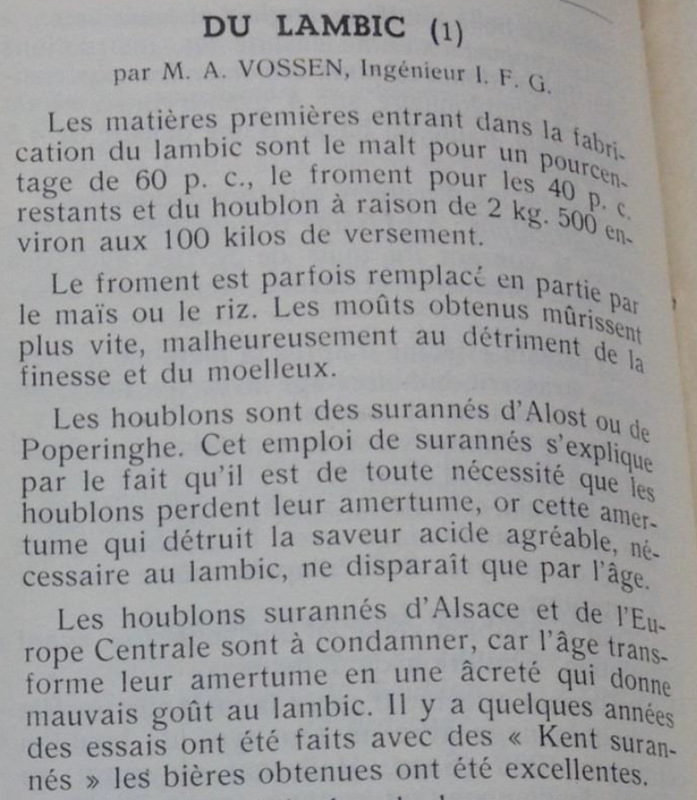 In 1937 an article in the journal recommends the same hopping rates 2.5 kg per 100 kg grain. However we see a major change here as the article says that aged hops are used exclusively for lambic. The journal is quite clear here by saying that it is necessary that hops lose their bitterness (by being aged) in order to work well in lambic. The recommended hops are Poperinge or Aalst (other continental European hops are again advised against due to their high bitterness). The journal does note that some had used aged Kent hops in trials and the results are great. Le Petite Journal du Brasseur has recommended English hops in a couple other articles, so it seems they were thought of favorably by Belgian brewers at the time. An article from 1946 sums up the changes quite well. 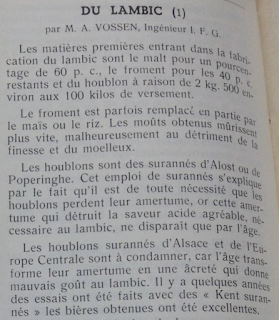 It notes that in 1890, Henri Van Laer (one of the leading Belgian beer scientists of the time) reports that hops usage in lambic was 700-800g/Hl (0.9-1.1oz/gal). The journal notes that lambic of this time was much more bitter than the present (1946) lambic. And that it would have similarity to some saisons (this is likely the article referenced by Farmhouse Ales p. 136). It is probably important to note here that the hops of the early 1900s would have been different from today's hops, and also that both modern and early 1900s hops would be different from hops used in the mid 1900s. 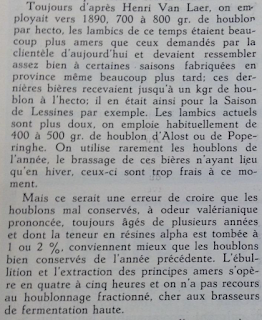 The journal notes that lambic of the 1940s is much softer, using only 400-500g/Hl (0.53-0.67 oz/gal). The hops are again Aalst or Poperinge and only rarely are hops of the same year used. These recently harvested hops are too fresh to use during the winter brewing season. However poorly preserved hops that have been aged several years are not recommended over well preserved hops from the previous year (thanks to FX for catching an error here in an earlier version). So while aged hops were preferred, brewers were wary of using hops aged poorly for many years and it may have been more common (or at least advised) to use hops that were only one year old over some hops aged longer. The journal also mentions that hops are boiled for 4-5 hours, generally in line with modern production. There is much more going on in non-lambic spontaneous fermentation and I won’t get into too much here, but here are some examples. The prime example of non-lambic spontaneous beer with fresh hops is probably Cantillon's Iris, which sees fresh hops in dry hopping as well as a mixture of fresh and aged hops on the hot side. At first I wasn't going to include this beer in this section, but I think that would downplay its novelty. This is something I’ve been coming to realize recently. I’ve always given Cantillon credit for taking traditional lambic integrity to new products (generally new fruits/herbs/etc.) but Iris is another good example of this. With how many brewers there are all over the world following lambic ingredients and process (and this is cool too), a Brussels-made 100% pale malt spontaneous beer is pretty cool. De Garde – Trevor says that they have been upping the hopping in their beers to decrease the acidity (the discussion starts ~29:30 in to his appearance on the Sour Hour). Mostly they use aged hops but they use some fresh hops, specifically in their saison-oriented beers. Fresh hops, when they use them, are added later on the hot side and come either at the end of the boil (5-15 min left) or in the whirlpool. Otherwise they favor aged hops, usually 3-4 years old Cascade or Willamette hops. After ~2 years Trevor notes that the bitter acid levels are around what he is looking for (0.5% alpha acid, 0.4% beta acid) but that there is still some isovaleric acid. At a minimum they use 1.5 lbs per barrel (577 g/Hl or 0.77 oz/gal), but they use around 3 lb per barrel (1160 g/Hl or 1.55 oz/gal) for lambic-inspired beers. Trevor feels that aged hops are necessary for the rustic/musty/wild/earthy character they are looking for in these beers. Jester King brews spontaneous beers following the lambic tradition as well as starting to add their own small twist. They buy old hops and store them in burlap sacks in their barn without temperature control. Initially they were using 1.5-2 lbs per barrel (577-770 g/Hl or 0.77-1.03 oz/gal) (see Jester King on the Sour Hour, this discussion starts at about 54 minutes in). This yielded a beer that measured 75-80 IBUs even though they were using aged hops. Note that this hopping range is on the low side of what De Garde uses, though the initial hops likely have some differences. There is also clearly a difference between modern hops and those from ~1900, but these hopping rates are in the ballpark of some of the higher hopping rates quoted in Van Laer and Lacambre. In trials Jester King then dropped their hopping rates to ~0.5 lb/barrel (187g/Hl or 0.25 oz/gal), which Garrett feels might be a bit too low of a hopping rate. So far Jester King reports brewing spontaneously closer to the lambic tradition but they are doing a bit of alternative experimentation with hops, such as adding 30 lbs of Sorachi Ace to a batch in their hop filter before the wort hits the coolship (so effectively like a hop back). They report 30 barrel batches, so assuming a full batch this is lbs per batch 390 g/Hl or 0.5 oz/gal. Ok, so there's a quick rundown of some modern producers as well as what was going on historically. With all the new brewers doing spontaneous fermentation I could research and write without end. Perhaps this could be the topic of a future post. But the point here was to write about hops in lambic and the idea that aged hops are a requirement of lambic. Hopefully you found it interesting (as I did) that fresh hops were a standard part of lambic for quite some time (roughly half of the time between my earliest source, 1851, and now). Look for more research on historic lambic in the future. The hops Armand is referring to are Challenger, specifically 5 years old and older.